Just what is it about tucking into bowls of bland, rubbery cartilage in broth that continues to inspire such demand? Simply put: few things suggest the whiff of money like shark fin soup in Chinese culture. This marker of class dates to imperial times. With the explosion of the middle class, demand has surged. Signing a deal and want to impress a client? Having a wedding and want to impress guests? Throwing an elaborate birthday bash and want to show your friends you’ve made it? Just add shark fin soup to the menu. 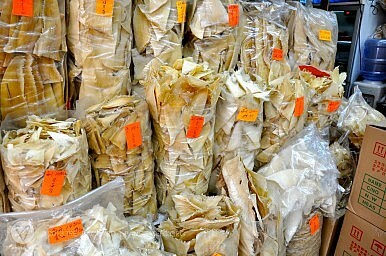 Given how entrenched this association between shark fins and affluence has become, the practice has become a habitual aspect of life in Chinese culture. A big-name banquet without shark fin soup is almost perceived as a slight to guests. Sheung Wan is a district promoted by the Hong Kong Tourism Board as a dried seafood mecca, Hofford explains. “You can see all kinds of fish drying down there. It’s a very smelly place” – and complicated.